Deelay Ceelay is the collaboration between video artist/musician Chris Lael Larson and percussionist Delaney Kelly, fusing live instrumentation with synched projected visuals. Deelay Ceelay blurs the divide between music, experimental film and performance while emphasizing the creation of a two-way exchange with audiences. 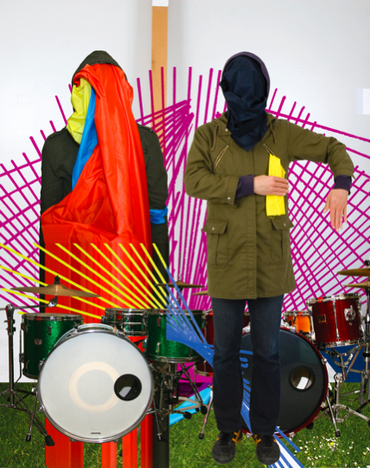 Based in Portland, Oregon, the duo have performed/screened in over 30 cities across the U.S., with work appearing at the Berkeley Museum of Art, the Portland Documentary and Experimental Film Festival, the Experimental Media and Movement Arts Lab, PICA and the Northwest Film Center. Tell me about the origin of and concept behind Deelay Ceelay. Before Deelay Ceelay, Delaney and I had been playing together for a few years in a more traditional rock band where I was playing guitar/singing and writing songs. The band had somewhat run it’s course and I was no longer feeling creatively satisfied with the constraints of how we, as a group, were making music. Tours started feeling arduous and it started feeling more and more like an obligation — more like a job. I decided to call it quits and do something new. We always kept two drum sets in our rehearsal space and Delaney and I would often drum together before practice. These informal sessions soon proved more enjoyable than our actual band practices. After ending the band, we had informally thrown out the idea of just performing on two drum kits and integrating synced projections and some electronics. Our biggest impetuous behind wanting to try something different was to just get back to having fun. To approach, quite simply, in the way that was the most enjoyable/exciting. On a lark, we put together a proposal to perform at PICA‘s TBA festival, they accepted, and we got to work on our first set and the accompanying projected visuals. We probably worked about seven months straight rehearsing and recording our EP before playing live. Our very first show was also our CD release party. So, yeah, it was motivated by wanting more creative freedom, wanting to have fun again and wanting to create danceable music that was a more engaging live experience than just the standard person behind a laptop mysteriously turning knobs. We both love dance music but often felt that there was something lacking seeing electronic artists “perform” live. I’ve also always been a big fan of watching live drummers and loved the idea of the energy that double drum kits could bring. To that point, to be honest, we weren’t really sure if it would work. It felt very much like an experiment and we weren’t entirely certain if we’d end up playing out again after that first performance. Leading up to this band, I had been experimenting for a number of years through a number of different bands with combining live/synced projected visuals. It seemed that there were so many people who were just projecting whatever they could find with no real intent, creating a very arbitrary pairing of live music and visuals. More often than not, I found it more distracting. Things were either too busy or random, or too painfully literal… there was rarely any degree of intent or vision apparent in the combination. I felt, and still feel, that live projections could be taken so much further. There is a culture of bartering in Portland, which seems unique for a city its size, considering how saturated it is with creative minded people. Please talk about the “Exchange With Deelay Ceelay,” which enables folks to trade something interesting with you (a piece of art, a lap dance, a night out on the town, etc.) for a recording of the first Deelay Ceelay EP. What are your feelings about trading goods and services versus monetary compensation? In our previous band, I was once approached by a girl, while at our merch table, who wanted an album but didn’t have any money. She offered to write me a letter in exchange for the album. I gave her my address and a copy of our album and a couple of weeks later I received a really honest/creative piece of mail complete with stories, images, drawings and a portion where I would answer questions and then send it back to her. Needless to say, this was much more exciting/engaging than getting a ten dollar bill. More than that, I’ve always valued the way that art/music can be a communication, a way to connect with people. And that connection is much more exciting when it goes both ways. A hand drawn letter is much more interesting/cool/meaningful than money. Also, we both really love playing music. We don’t really love being salespeople. Performing music can be really intense/cathartic. The last thing that I want to do after playing a show is to camp out behind a merch table and sell people stuff. I never wanted to be a merchant. It was also really liberating to not be concerned with being a financially viable entity. By doing this, we removed any pressure that comes along with the metrics of how many units you’re selling. It was much more exciting to just give it away with the open invitation for folks to give something back if they felt so inclined. The other component of giving away the EP is the idea that we had both taken so much inspiration from our community that we wanted to give something back. We called the EP “thank you” because, to us, it was a “thank you” gift to everyone who has inspired us. In addition to it’s availability on our website, we also personally mailed copies to our favorite writers/artists/musicians/dancers/designers etc. Seeing Deelay Ceelay live is a visceral experience. 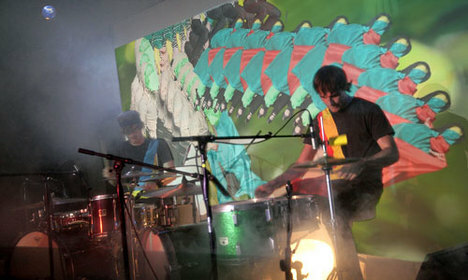 While the focal point of your live show is, by design, the colorful video projections, it is also the force of two drummers playing synchronized beats, and the overall sound and media experience that drives the audience to respond by moving their bodies in ways they hadn’t anticipated. Will you talk about your ideas related to performance and audience? We put a lot of energy into making the live experience as unique as we possibly can. In addition to the music, projections, lighting, ambiance effects, we’ve more recently extended into integrating live dance/choreography. Especially in terms of dance or electronic music genres, we really want to have more of a performative presence with the live incarnation. Again, getting away from laptops or control surfaces or keyboards — integrating something more physical, more bombastic. Drums! It’s been an interesting experiment as we’re neither a typical rock band nor do we fit into the “electronic” mold. To that point, I feel like we’ve only really scratched the surface as far as the potential of what can be done in terms of taking the live experience to new levels. Interestingly, there have been instances where the audience, responding to such a strong visual component, has responded by behaving more like a film audience than a rock/electronic audience. Or, alternatively, the phenomena of people making hand/finger puppets/silhouettes in the projection, which I really love. 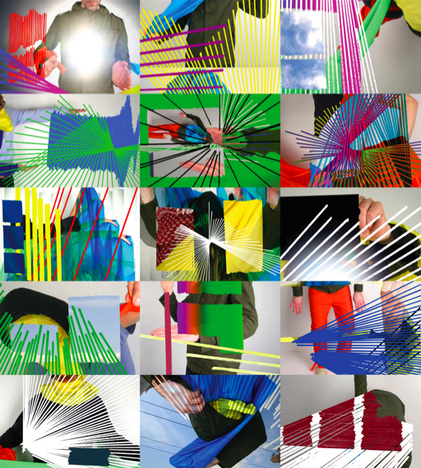 I see it as a form of interaction — they’re contributing their own shapes/gestures to the projected images. This is much more exciting than folks who are afraid of disrupting/blocking the projections. With the distinct Deelay Ceelay aesthetic and use of primary colors, to the photographs of faceless human figures in the projections, you’ve created a visual language that translates both on and off the stage. Please explain the strategies used for branding and packaging the Deelay Ceelay experience. With our live experience having such a strong visual presence, we wanted very much to create a consistent aesthetic. Something that was engaging and visually kinetic. Something that synced with the rhythms/energies of the songs without being literal or too specific. In much the same way that a band would create a sound with its music, we sought to create a cohesive world of our own. Although, in practice, the formation of our visual style wasn’t really as deliberate as it may sound. I think that most people have certain styles, musically or visually, that they naturally tend towards, without even trying. Using primary colors allows one to use a large number of tones without things starting to clash. There’s also something “equal opportunity” about it because our color selection is more representative of the entire visible spectrum than a reduced palette might be. I suppose it’s a really all-inclusive color palette. Any primary color we add is generally done so sparingly, and balanced with something neutral. Most of the color in our visual work comes from the imagery — the things shot in camera. Natural elements. Human figures. Colored fabrics. With the use of masked figures of both others and ourselves, we wanted get away from having specific recognizable figures. We are more interested in the energy of movement or using bodies to create kinetic abstractions. We want the figures to be more mysterious and more about the vibe or a feeling that they embody through their motion and costuming. This approach can get complicated through showing faces since so much information is communicated through facial gesture. Especially since the video work is not conveying any sort of traditional narrative. Obscuring our faces also conveniently allows us to sidestep the unavoidable cliché of band photos. Neither of us are fans of the necessary evil that are band photos, and would rather that our likeness not be strongly associated with our music. To us, it’s much more exciting to have people relate a visual style or word with our music than a press photo. Similarly, since we are in our own videos, we wanted to make our on-screen selves anonymous, masked, as it seemed like it would be too self aggrandizing to be performing in front a giant projection of ourselves. That’s just not the sort of ego we have. Deelay Ceelay vs. The Beach Boys from Chris Lael Larson on Vimeo. Of all the previously recorded material out there, what inspired the Deelay Ceelay cover version of The Beach Boys’ Sloop John B? As with our other live remixes, we end up choosing songs that we’d like to hear if we were at a party and there was dancing. It’s just a song that I’ve always loved and felt that we could rework it in a way that was both interesting and respectful of the original. We’ve had people tell us that they hate the Beach Boys but really love that version. I also really like remixing songs that are unlikely candidates for remixes. Making a hard-hitting party jam out of a mid-tempo piece of vocal-heavy Americana. It’s also a song about being sad, having a horrible time and, ultimately, wanting to go home. I like how reworking it can turn it on its head. Do you have any forthcoming projects, tours or new collaborations? As mentioned earlier, our first full-length LP is finished and will be released later this summer along with a new batch of accompanying live visuals. We also have a number of remixes that we’ll be releasing over the summer — some of the remixes that we’ve done live, in addition to some local collaborations. We’d love to get back out touring as soon as possible, however, we don’t have any dates to announce at this time.